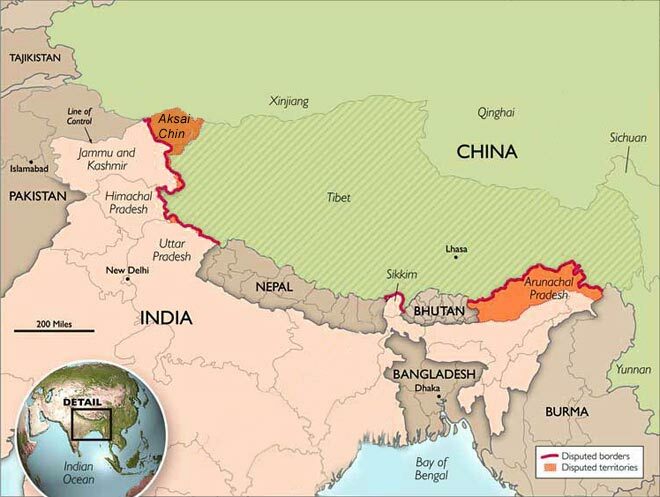 India giving asylum to Dalai Lama triggered the war as the Chinese saw this as Indian interference in Tibet. China wanted to take over Tibet and induct it into the communist state, at that time Tibet was a sovereign theocratic state but a very peaceful one. India supporting a covert guerrilla war in Tibet. This was actually being perpetrated by the Americans and the Pakistanis, but Mao ended up blaming India. Chinese got greedy and wanted to grab Aksai Chin, a disputed territory which India claimed was part of Ladakh but Chinese saw it otherwise. The actual reason for going to war was a combination of all these and an X factor known as Mao Zedong. Mao had somehow got in his head that India and in turn Nehru was challenging China for ascendancy in Asia. JFK had compared India and China, saying that US should be aligned with the secular democratic behemoth in Asia rather than the communist dictatorship. Mao did not see India and Nehru as competitors, he saw India much like India sees Pakistan, a small nation whose aspirations are unlimited but people and ideology are very limited. The mass murderer Mao wanted to punish Nehru and he had grown to become deeply mistrustful of Nehru and India. His mistrust and paranoia was then exacerbated by India giving asylum to Dalai Lama, on top of that Nehru and his coterie of acolytes, refused any land deals with China. Once Mao who was supreme dictator in China had got something in his head it was next to impossible to dislodge it, on top of that there was no one in China to oppose him. Mao flooded the Akai Chin region with Chinese troops, who started building a road to Tibet, which would make it easy to connect Tibet with the Chinese mainland. Nehru saw this as an indiscretion. Nehru ordered his poorly prepared Army to retaliate. India had recently ousted the Portuguese from Goa. Nehru and his ministers saw this as a vindication of the strength of the Indian Army. They thought that the Army is ready to take on any challenges and does not need upgrades, the fact of the matter is Indian army was ill prepared, they had outdated weapons and very little air support, Portuguese were a dying power but China was a rising one. Not only did China had strength in numbers, they had better equipment and their generals were battle hardened after engaging in bloody wars like Korea. Situation became bad to worse when Nehru ordered his troops to create forward posts i.e. go deep in the Chinese territory and set up a camp, this was a disastrous idea. There was no support to those posts and Mao did not take this audacity lightly. Mao decide to punish Nehru, a lesson that he will never forget. Chinese Army absolutely decimated the Indians. Indian army suffered heavily, panic set in and the while nation lost morale. This is when Nehru reached out to Kennedy for help, who along with the rest of the west provided support in terms of weapons and other essentials. Kennedy also intervened to prevent Pakistan from taking advantage of the situation. Nehru told Ken Galbraith, who was Kenndey's ambassador to India that he would need US firepower if the Chinese started moving towards Assam and Calcutta. Ken an erudite on Asia, and a mentor to Kennedy tried to help India as much as he could. In the end the war ended thanks to Kennedy's offer to help which might have acted as a deterrent to China. Not exactly true, while potential American intervention might have been a factor, Mao had done what he set out to do. He destroyed Nehru, he took over Tibet, he showed the world who is the real power in Asia, he also got Aksai Chin as a bonus. This was no ordinary war, this war changed the complexities of the world. It forged a China Pakistan Axis which still persists and has tilted the balance of power in Asia. Indian psyche was permanently scarred, Indians have a deep mistrust of the Chinese and even acquired Nuclear weapons as a deterrent to China which in turn led to Pak acquiring their own. This incident also bought India closer to US, which was later thwarted by Nixon and Kissinger. This is a brilliant book by Bruce Riedel, well researched and written. My only complaint is that the book deviates sometimes from the India china war and focuses too much on Cuba, but even that part is quite interesting to read. The book also establishes Kennedy as the ultimate crisis manager, one of the best presidents of the USA. I definitely hope to read more from Bruce Riedel in the future.